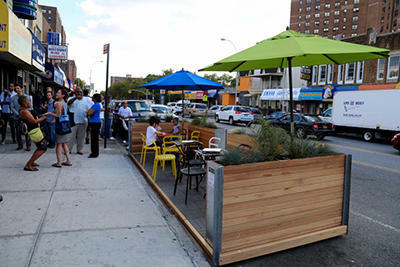 Platform cafes, like this one in Brooklyn, NY, are built into parking spaces outside a restaurant. When the city commission first approved sidewalk cafes in 2014, it considered adding platform cafes – but voted it down. Bacigalupi says there were concerns about losing parking spaces. Under the new proposal, only four platform cafes would be allowed per year. And the cafes would be barred from the busiest sections of Front Street. Traverse City Commissioners voted yesterday to replace some parking meters with electronic pay stations. The Downtown Development Authority (DDA) made the request partially because thieves stole $70,000 from parking meters two years ago. They had copied meter keys and also broke open meters to gain access. 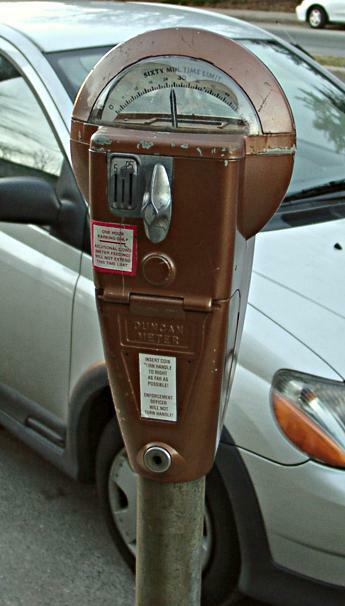 Annual parking meter revenue is approximately $650,000. The 12 pay stations will be installed in five downtown parking lots and one block of Front Street. The particular block has not been decided yet, but the DDA is considering between Cass and Park Streets. The Traverse City Film Festival is asking for public money to help pay for a Hollywood-style “walk of fame” outside the State Theatre. The walk-of fame would feature concrete handprints of celebrities like Madonna, Rosie O’Donnell and Matthew Modine. To keep it accessible year-round, festival officials plan to install a heated sidewalk in front of the theatre. They’re asking the publicly-funded Downtown Development Authority to contribute $18,000 toward the effort. Traverse City Mayor Michael Estes said that could set a bad precedent.